The External Battery Pack model is 13 lbs lighter than the Internal Battery model and allows you to leave the machine in the car and only bring in the battery to charge. There is also no need to take the machine apart when the battery needs replacing. 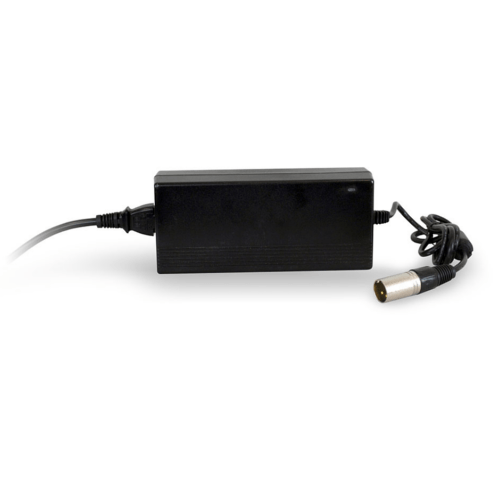 If you would like both a battery and an AC Adapter to power from an electrical outlet please choose the Internal or External Battery option below and then add the AC Adapter further below. Both the Standard and Fast Chargers are smart chargers and cannot overcharge the battery. The Fast Charger may slightly reduce the battery longevity. The Carry Case is very popular. It allows you to lift the machine with one hand, has a pocket for the remote and manual and also acts as a dust cover. The Dust Cover is a bit thinner and just protects from dust. You can roll the machine with either item on. 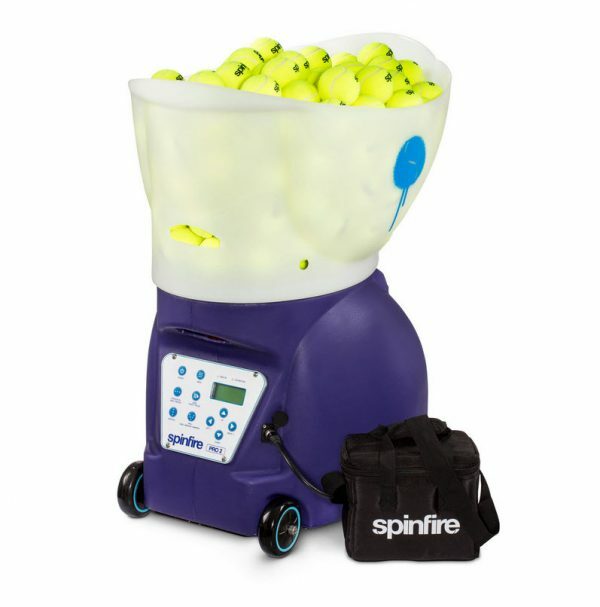 These premium quality pressureless balls (formerly branded Spinfire Juice) are more economical over the long run than pressurized balls as they are designed with the Spinfire Pro 2 in mind, last multiple times longer, bounce consistently and do not jam the machine as they do not go flat. See 'Balls' on the menu above for ball pack descriptions. We do not recommend inexpensive pressureless balls to be used in the Spinfire as they fall apart quickly. The optional 4-Yr Warranty extends the Standard 2-Yr Warranty under the same terms and conditions. The battery remains at the initial 6 mos. Note that the Spinfire Pro 2 has 5 motors, 2 sensors, 2 switches and a power jack along with membrane control panel incorporating a circuit board and display. No warranty card is required to be returned. This warranty starts from date of receipt of your Spinfire, not the earlier date of purchase. Received the Spinfire in one week on the west coast. Works great, easy assembly and the external battery is a nice feature. I purchased my Spinfire Pro 2 in early 2014, so I’ve had it for a significant amount of time. I also purchased the Spinfire pressure-less balls, and have worn out a couple of sets (I tried another brand after the first set of Spinfire, and they were not nearly as good, so I went back to the Spinfire balls). The functions and features of the machine operate as advertised, and the machine is capable of feeding with a full variety of pace and spin, with the various vertical and horizontal patterns. It has the capability of feeding all types of shots encountered in a tennis match. It will definitely provide a great workout, and is a great tool to help develop stroke fundamentals. The machine easily fits in the back of my mid-size SUV, and it weighs about 50 lbs – I can easily get it in and out, but it’s a bit bulky and heavy for my wife to do it on her own. The remote works well, which makes it convenient to start and stop when on the other side of the net. I have replaced the battery a couple of times, but I have learned how to manage the life of the battery. I consistently run the battery completely down each time I use the machine, and then fully recharge it after each use. And I’ll turn it on in the garage and let it run until all of the way down and then recharge if I go more that a couple of weeks without using the machine/battery. Since I’ve started doing this, the battery has great range, and I’ve not replaced it since. As with any mechanical device, there has been a couple of minor issues that required repair. Leon with Spinfire USA has been incredibly responsive and helpful in guiding me through the simple repairs and providing videos to illustrate what to do. The service that I’ve received from him has been outstanding. The machine is a great value for someone looking to improve their tennis game. 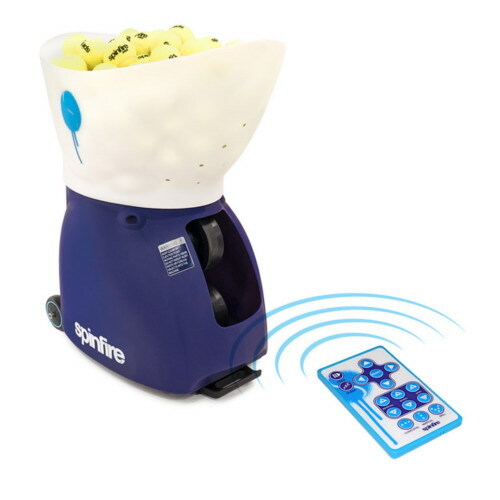 I bought the Spinfire Pro 2 Tennis Ball Machine with an external battery in May 2018. I also purchased three packs of pressureless tennis balls (72 balls per pack). I am 58 years old, a very good player, and still in reasonably good shape. I used the Spinfire Pro 2 for a number of months (several times per week for about an hour at a time) and here are my impressions. The machine itself is fabulous! It is easy to operate, and the remote control allows me to make adjustments while on the opposite side of the court from the Spinfire Pro 2. By adjusting the speed with which the balls come out, the depth and placement of those shots, and the interval between shots, I can practice exactly the way I had hoped. The drill button allows me to alternate backhands and forehands, and I can move myself from side to side in exactly the right amounts by choosing between several drill levels. I have not had any mechanical problems with the machine such as a ball getting stuck or even so much as a misfire. I am so pleased with the machine that I would give it a 10 out of 10. Yet there is room for improvement. Below are my four (minor!) complaints. 1. The remote control does all of the important things and is easy to use. But, ergonomically speaking, it is flawed. First, the button to halt the machine on the remote – and you will certainly want to halt the machine when making adjustments to intervals, speed, whatever – is just one of many buttons on this tiny, flat rectangular remote. The problem is that you cannot find this button (which is in the upper left corner of the remote) by feel alone, which is exactly what you will find yourself trying to do when you’re in the middle of drilling yourself. When I reach into my pocket for the remote to pause the machine (which I frequently do when the machine has worn me down and I need to slow the action down), I must simultaneously look at the remote and then dodge the balls that are flying at me (I like to have the balls shooting out fairly rapidly, as they would come at me in a serious game). I frequently push the wrong button when trying to pause the machine and end up changing something that I didn’t want to change. The obvious solution is to put a raised pause button in the center of the remote and to make it much larger than the other buttons, as this is the one button that you will use over and over. 2. It is not easy to adjust the vertical height of the balls on either the remote or the machine itself. Oddly, the vertical adjustments are not part of the ordinary set of adjustments, and when you do attempt to make an adjustment, the machine jumps to various levels instead of simply allowing the user to slowly raise or lower the height from the existing level. 3. The battery that I was sent was, apparently, defective. It didn’t hold a charge for long, and after a few weeks it would only last about 30 minutes on a full charge. The good news is that the Spinfire dealer was very accommodating, and he sent another battery to me at no charge. So far, the new battery is great. 4. The Spinfire Pro 2 is pretty darn heavy. It’s quite an ordeal for me to get (a) a heavy machine, (b) a heavy battery, (c) a heavy basket of balls, and (d) a light tennis racquet to my court. I have to go up and down a few sets of stairs (I live in a condo) and, well, let’s just say that I can manage it at 58 but would not be able to do so at 78. My wife cannot lift the machine down the stairs. Of course, most people won’t have to deal with bringing the machine up and down narrow stairways. If not, it is easy to wheel the Spinfire Pro 2 with one arm on a flat surface. Regarding the balls: I was on the fence about which type of balls to get, but I’m very pleased with the pressureless ones. Yes, they’ve lost a little oomph over the past few months, but the loss is less than what occurs with “real” balls. Despite the minor negatives described above, I still give the Spinfire Pro 2 a score of 10 out of 10 because, when it comes to the important things that I was hoping to get from this expensive machine, I got it all. It is no exaggeration to say that the Spinfire Pro 2 has changed my life for the better. I ordered Spinfire Pro 2 for my son as he needs continuous practice. This machine is beautiful and is packed with a lot of power and variety. It is capable of simulating pretty much all possible tennis shots with a combination of settings. Settings are very easy to change from control panel or remote. Remote itself is very slim and easy to use. The best part is that machine is very quiet and the machine doesn’t move due to internal oscillation. I chose the external battery option which reduces the weight of machine and makes it easy to lift or carry the machine and battery separately. We have got so many compliments for this machine. Customer service is great. Leon was very patient and helpful in answering all my queries on phone and via email. I think I have made a right decision and my son and I plan to use this machine regularly. I will definitely recommend this machine to anyone who is serious about tennis. Just buy it you will not regret. Great machine. Excellent customer service! I spent a ridiculous amount of time researching these ball machines, even made a spreadsheet to compare. I spent what must be hours on the phone talking to the competitors. I must have called Spinfire about 4 times asking questions and even emailed after hours and on the weekend and got replies same day every time. Pre-sales support was fantastic. This machine isn’t cheap but by far the best value. I like it that the machine doesn’t move which is essential for random/player mode. I realized pretty quickly any machine that doesn’t have that is an old design. I also liked that you didn’t have to pay extra for the remote because you can’t really use one of these without one without running back and forth all the time to change the settings. The machine has all the kinds of settings you could possibly want and lots of drills. I can’t say anything bad about the Spinfire. I am VERY happy with my purchase. I did a lot of research for the type of ball machine that had the features I wanted. Out of all, the Pro 2 fit what I wanted. The only thing it did not have was the ability to store specific, custom drills. The company may consider these in the future. The machine is easy to use and quiet. With the internal battery it is a bit heavy but nothing unmanageable. I have put nearly a thousand balls through it to date and it had performed without any problems. It is easy to change the speed, spin, ball interval, elevation settings from the remote control or control panel, even while balls are flying out. However, you cannot save any of those settings into memory. You have to set them manually each time so I made a small card and laminated it and keep it with the machine for quick recall of what works for me. Only the last settings are saved when the machine is turned off. I have used many different kinds of pressureless balls and was not a fan of them. However after speaking with the company, I decided to try two packages of them since they were supposedly designed for use with the machines. They definitely perform well, much better than balls right out of the can. They are consistently thrown by the machine and have a consistent bounce. I did find one or two that had a less than desirable bounce but that was not a problem. The balls are more than you would pay for three cases of Penn but hopefully (as much as we practice) they will outlast them. If you are serious about your tennis and want a partner that never tires, never complains and wears you out, the Spinfire Pro 2 is what you need. I highly recommend this machine and, if the company offers additional features in the future, I hope it will be offered as an upgrade to existing machines. I also recommend the balls, although they are higher than regular balls. You won’t be disappointed. The Spinfire is a great ball machine. I’ve had my machine for about 3 years and it has provided hours of great drills and exercise. I even upgraded my machine to have the full featured remote which is now being sold with new machines. Internal oscillation, two-line drills and horizontal and vertical drills make this a true full featured machine. I also like being able to move the throwing wheels with the remote from one side to the other for fine tuning from the opposite end of the court. The machine can also be put into sleep mode when picking up balls which conserves the battery. The machine is portable but it’s on the large size so it may be a challenge fitting it into a smaller car but if you have a mid-size or larger vehicle, it shouldn’t be an issue. The company (Spinfire) is fantastic. I had a defective throwing wheel and they replaced both wheels for free even though my machine was beyond the warranty period. They truly stand by their machine and provide excellent customer service. 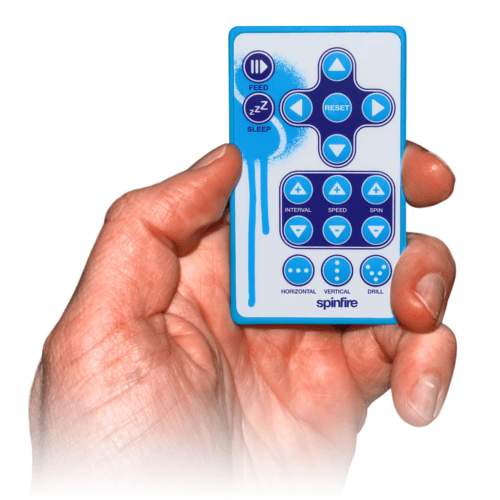 Leon was great to work with and very knowledgeable about the Spinfire product. 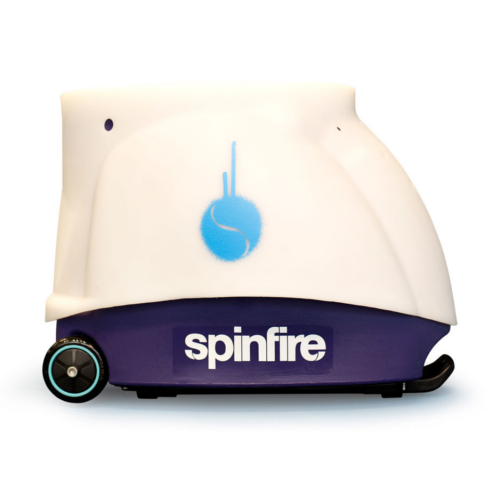 If you are looking at a full featured machine, you should definitely consider Spinfire. It’s not inexpensive but compared to other machines with similar features, it’s definitely a good value. Happy hitting! I’ve got this ball machine about a month ago I can say – this is AWESOME! In 2-3 weeks you will start to see the result. I like all features in it and will not list them. 2. Flimsy and hard to retract handle. 1. Memory slots for different settings combination. And here is my video hitting with ball my best partner – Spinfire Pro 2!!! I ordered the Spinfire Pro 2 for my daughter. She is 12 and I can’t keep up any more. This machine provides extraordinary challenge even on the low settings. She will definitely be able to grow with this machine. The cost was steep, but not out of line with other machines of it’s caliber. The user guide is easy, but it would be great to have a quick guide to stick on the side or something. But I’m sure it will get easier to remember different settings as we continue to use it. If you have a favorite setting, the machine will automatically remember the last setting used. It is very heavy! So getting it in and out of the SUV is a bear for us. All in all, I’m very happy with the purchase and the customer service was excellent! Light, very mobile. Super work out. Does everything preparing one for the complete all court game. I purchased the Spinfire Pro 2 about a month ago had have enjoyed every aspect of it. The settings are easy to use. The system does everything that is advertised. The Internal oscillation is a great feature!!! Other companies offered similar products that promote additional features that – just aren’t accurate. Spinfire Pro 2 is the real deal. The Spinpro 2 is a great tool for practicing your game. However, it would be better if it were easier to see the programmable screen on the machine itself. It is somewhat difficult to understand all the possibilities of practice. I do not regret investing in this ball machine. This machine is great and fulfilled my expectations. My son and I are using the Spinfire 2 almost daily. It has been very consistent and reliable from the start. Transport has been easy with handle and wheels. The internal oscillation is ideal. The remote works well. Overall a great value and everything we were looking for! The great thing about these tennis ball machines is that they never complain or argue, never cancel last minute on you and are always ready when you are. This machine is great, I hope it will serve me and my son for many years. This is a great machine for practice and a good work out. Easy to program with on front panel or with remote. That remote is very handy and it works from the other side of the court. Great spin, ball speed and oscillation. The drills work fine. I think the machine may be targeted for really good players because the ball speed, spin and drills would kill many that dare to try some of the max settings, especially with a full load. Who has $300 to spend on filling this thing up with 200 balls. 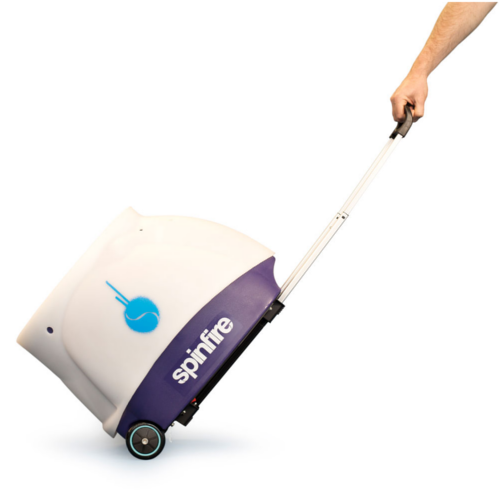 Perhaps a smaller model (Spinfire Pro Lite) with 80 ball capacity will be available in the future for those that need a lighter machine. After all, those pressureless balls come in packs up to 72balls and a those ball pick up baskets usually hold up to 80balls. Luckily none of the above issues bother me much 😀 I am really pleased with my purchase. I almost forget to mention. The machine arrived within 2days!!! So, excellent shipping. When I contacted customer service with some of my suggestions they received them in a very constructive and appreciative manor, so full marks to customer satisfaction.